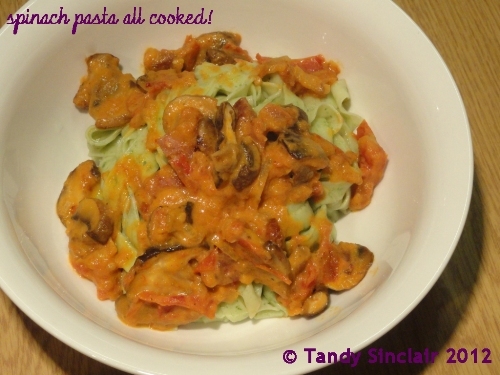 I started this week worried that my recipe would be the only one for Presto Pasta Nights! But slowly the emails started arriving. The first one is from Gay, A Scientist In The Kitchen and she has delighted me with Broccoli and Woonsen Stirfry. The next recipe to pop into my inbox is from An Escape To Food – the recipe for Udon in Tomato-Beans Broth is a pantry / freezer explosion of taste. Shelby, who is better known as HoneyB who blogs at The Life and Loves of Grumpy’s Honeybunch has made this awesome Thai Peanut & Chicken Noodles (her words!) and after reading the post, I have to agree! The last submission this week is from Joanne, who Eats Well With Others. Her Spaghetti in Tomato-Apple Sauce shows that fruit in all forms is great with pasta. Thanks to everyone who took part in this week’s Presto Pasta Nights. A short but sweet (err delicious) round up! Everything looks so tasty. Thanks for the delicious round-up, Tandy! Presto Pasta Nights is one of my fav. blog events to participate. I am too fat for noodles this week!! I must admit, I WANTED to share a pasta dish this week, but somehow the days just flew by. The list might be short, but oh so delicious. Thanks again for doing such a fine job of hosting Presto Pasta Night. they all look great indeed AD!